The Band, one of the most celebrated rock and roll groups in history, had its roots back in the 1960’s. It was comprised of four Canadians and one musician from Arkansas. They were the backup band for Bob Dylan, Neil Diamond and other heavyweights from that era, but they became famous on their own in the 1970’s. 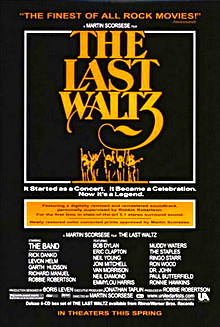 After sixteen years on the road, they had a farewell concert, “The Last Waltz” in San Francisco, which was filmed by a young Martin Scorsese. Unlike the usual boring style of filming rock concerts, Scorsese brought a professional Hollywood style moviemaking, and the film, which was released in 1978, is still a classic, and a re-release version came out on DVD in 2002 along with a 4-CD box set. The concert movie is excellent and can be rented on Netflix or purchased. The members of the group were Rick Danko (bass), Garth Hudson (keyboards), Levon Helm from the US (drums), Robbie Robertson (lead guitar) and Richard Manuel (harmonica and many other instruments). Helm, Manuel and Danko are no longer alive. Helm remained a big country star, best known for his singing, until he passed away this past April. This song, from the “Last Waltz” collection, is called “Ophelia” and is sung by Leon Helm. He was probably the best singer in the group. This video has been viewed over 1.2 million times on YouTube. The audio is poor on the video, but it gives you an idea about how they looked over 40 years ago. Also below is the MP3 audio from the album — better sound quality. The video is not from the movie—the mp3 audio is. I caught The Band several times over the years and was a fan from the Big Pink days. These were the guys Dylan used when he first went ‘electric,’ much to the ire and chagrin of his folkie fans. As you say, Levon was the best vocalist,(The Night … Dixie Down is probably his definitive vocal, imho). Live, the harmonies were frequently off, but I was never disappointed by the show. RIP Levon! Totally agree, co-wrote some great stuff with Dylan, et al, as well, Not a shabby guitarist either! Levon was the best drummer that this country has ever produced. Period.